Visit Jeep for more information on the Jeep Liberty. The sporty Jeep Liberty returns for 2009 with its rugged stance, seven-slot grille and trapezoidal wheel openings the Liberty's design stays true to Jeep's legendary heritage. Three models of are available - the Jeep Liberty Sport, Limited and Rocky Mountain. Inside the Jeep Liberty is a roomy functional interior. For added cargo space the rear seats fold flat creating 64.2 cubic feet of storage room. There is an available flat folding passenger seat if extra room is desired. Sky Slider is available - a full-length open canvas roof that can be moved into several different positions at the flick of a switch. The 2009 Jeep Liberty Sport modes feature body-color fascias and wheel flares and 16" aluminum wheels. Limited models feature side roof rails, a light bar and 17" aluminum wheels. 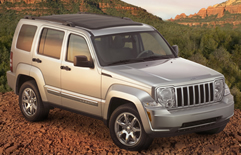 Standard on all Jeep Liberty models is a 3.7 Liter SOHC V6 with 210 horsepower and 235 lb.-ft. of torque. A four-speed automatic transmission is also standard. There are two 4x4 systems available - Select -Trac II Full-time four wheel drive system and Command-Trac® part time four wheel drive system. Improvements made by Jeep for the 2009 Liberty include stiffer rear axle shafts and retuned springs, shocks, anti-roll bars and steering gear value to give a more precise feel to the steering and handling. The standard safety features for the 2009 Jeep Liberty are numerous and include an Electronic Stability Program (ESP), Electronic Roll Mitigation (ERM), Brake Assist, ABS Brake system, advanced multi-stage air bags, hill descent control, hill start assist and a tire pressure monitoring (TPM) system amongst other features. Get a Free Price Quote on a Jeep Liberty.